The Model 86 Foil Stamping Printer is easy to operate and extremely versatile. This model is an excellent choice for stamping individual names, initials, logos or multiple lines of copy on a variety of materials. Our machine is capable of hot foil stamping on leather, book bindings, stationary, napkins, cards, albums, bibles, ribbons, vinyl and much more. 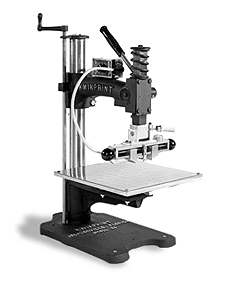 The Model 86 has a vertically adjustable printing head, allowing for up to a 6" clearance between the typeholder and printing platform. An automatic heat control and 12” x 12” fixed platform are standard equipment. In addition to various sizes of typeholders to select from, depending on your desired “maximum imprint area,” some other popular and useful attachments include the automatic foil advance, two-way adjustable platform (left-to-right movement), and flexible arm machine light. Click here for more information on our Hot Stamping Type and Dies.